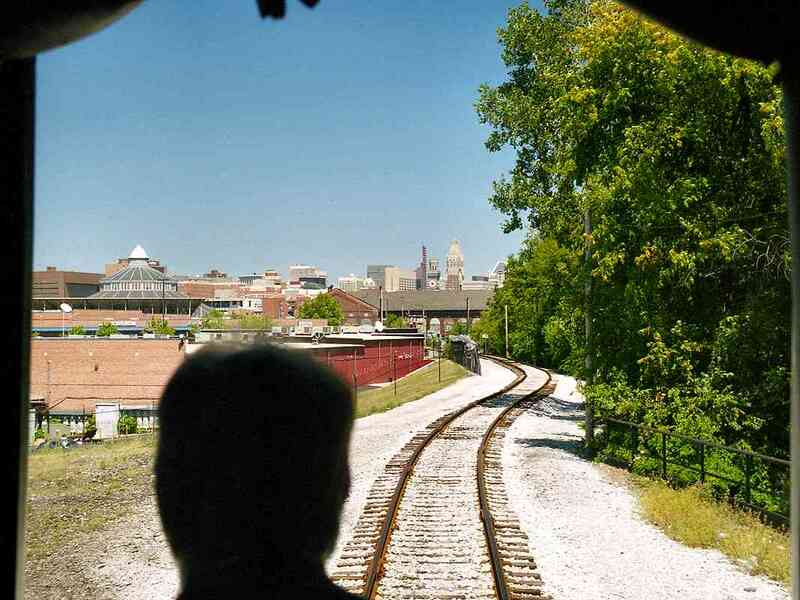 Why did railroading begin in Baltimore? During the early 1800s, Baltimore's Atlantic ocean coastal location was farther west (inland), than that of rival port cities Philadelphia and New York. 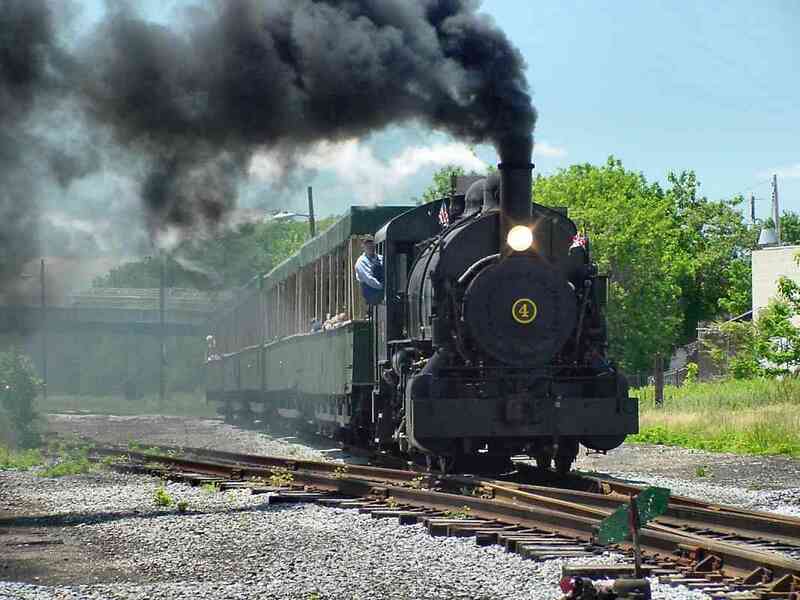 This meant goods between Baltimore and the burgeoning Ohio Valley did not have to travel as far along muddy roads via the sluggish horse-drawn wagons of the period. Though Americans did not settle northwest of the Ohio River until 1788, crops ruined by especially cold weather during 1816 ("the year without a summer" toward the end of the Little Ice Age) caused many farmers to relocate from New England to the Ohio Valley. This in turn increased demand for easier transportation to the coast. Construction in New York State of the Erie Canal began in 1817; when the canal opened in 1825 it immediately cut the cost of midwest freight transport from $100/ton to $10/ton. Shippers opted for the cheaper route through New York, and soon the port of Baltimore found itself wanting for business. Washington, DC felt the effects too, and began construction of the C&O canal. Faced with transport competition from both north and south, Baltimore city leaders met in 1826 to devise a solution to the rapidly declining demand for their port. This tour starts at Mt. 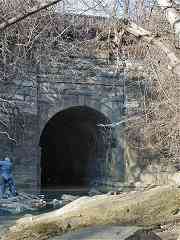 Clare which is located about a mile west of the center of the city of Baltimore, Maryland. In 1828, the B&O wanted to begin its railroad downtown at the city's harbor, but wrangling over the exact route delayed progress, so construction started near what was, at that time, the western edge of the active city. Over the century that followed, Mt. 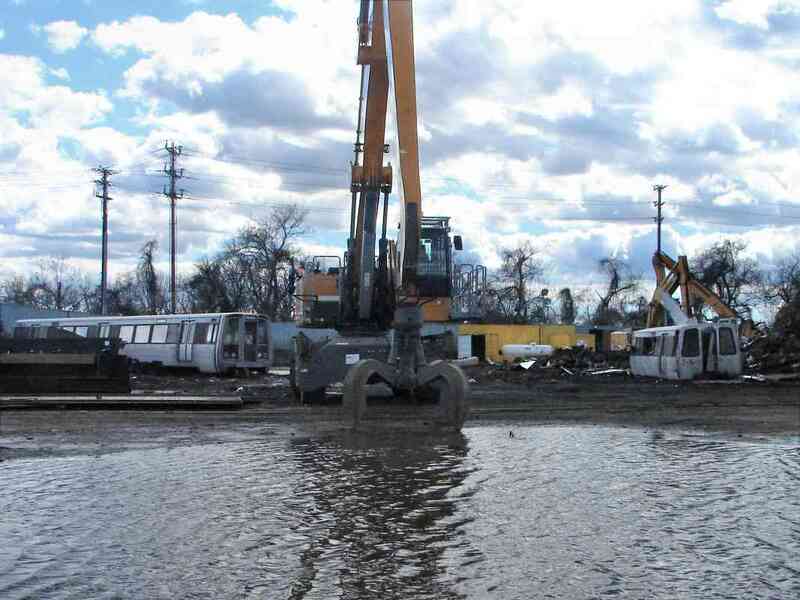 Clare would evolve into a major terminal, with a large train yard, car repair shops, locomotive construction facilities, and even the passenger station shown in this photo. Mt. Clare is the second-oldest railroad station along the Old Main Line (OML), younger than only the Ellicott City station we'll see later in this tour. 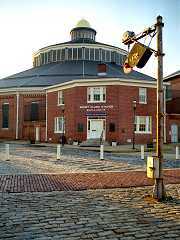 The station is now home to the B&O Railroad Museum. Behind the station is the 1885 roundhouse that originally served as a car repair shop. 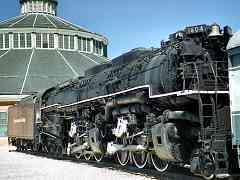 Now the structure houses the museum's impressive collection of old locomotives. 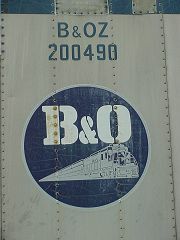 The B&O Museum is open most days, and is a highly recommended stop for all railfans. The 1936-dated photo linked below shows a plaque mounted on the exterior of the building which reads, "This Building Erected 1830 is the first passenger and freight station in America and the oldest in the world. 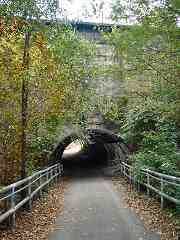 At the time of its use, trains were pulled by horses between Baltimore and Ellicott's Mills. 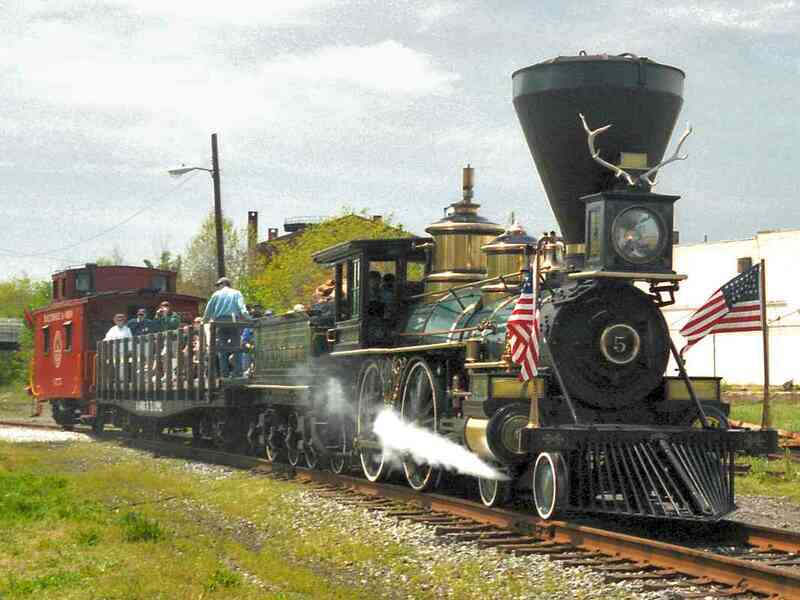 Baltimore and Ohio, The Pioneer Railroad of America, the cornerstone of which was laid by Charles Carroll of Carrollton, July 4, 1828." Other historical documents show this station building was actually constructed around 1850. A passenger "shack" may have previously occupied this spot, but other records place it a short distance west. 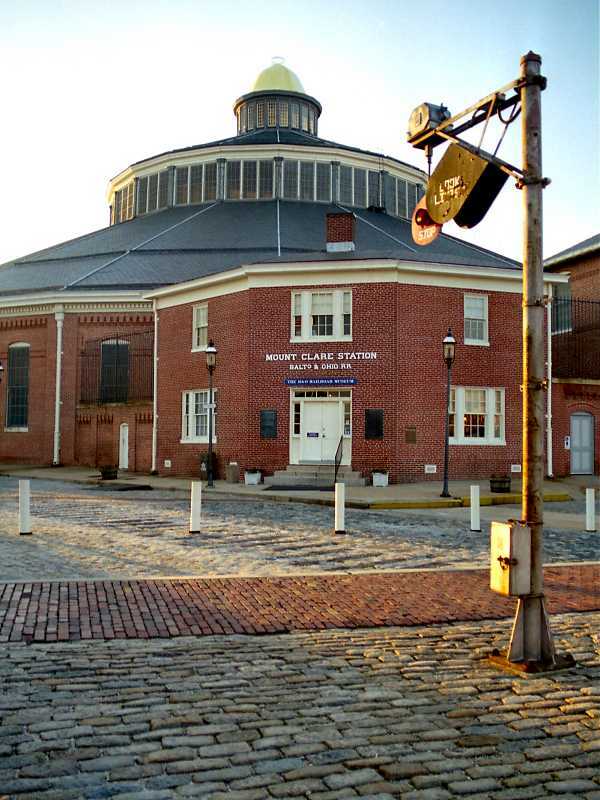 In February 2003, 2 feet of snow caused the roundhouse's roof to collapse; it has since been repaired. Resting behind (west of) the roundhouse is one of the more impressive modern locomotives in the B&O Museum's collection: Chesapeake and Ohio 1604. 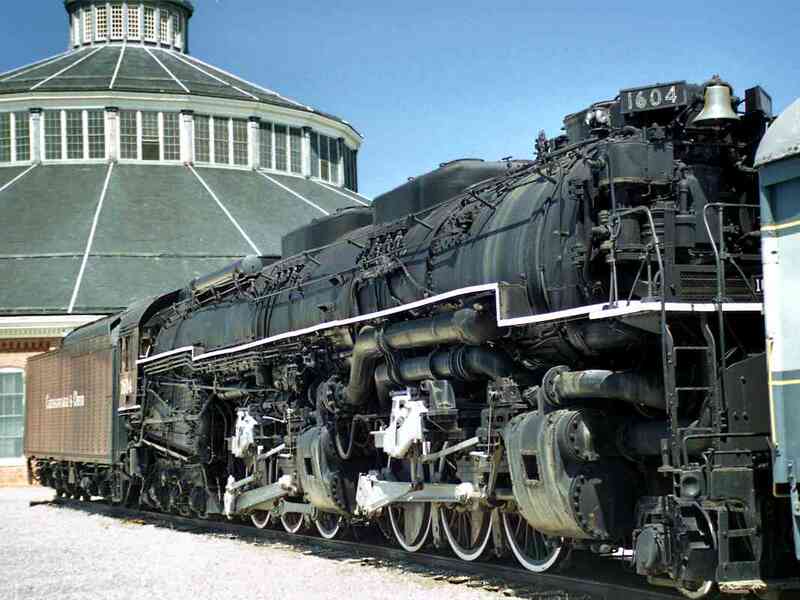 This 2-6-6-6 Allegheny weighs in at 778,000 pounds, making it the heaviest reciprocating steam locomotive ever built. It's tough to appreciate the immensity of this beast from a photo. Those wheels are about the height of a person. 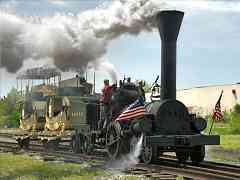 Despite its size, the power of the steam engine is dwarfed by that of newer transportation technology. For example, the weight of this unit is just about the same as that of a Boeing 747 aircraft. This locomotive generates 7,500 horsepower, but each of the four jet engines on the 747 generate about 15,000 horsepower. Link to older picture: 1970? For the museum's All Aboard Days in spring 2002, they operated one of their more recently restored steam locomotives, a Porter 0-4-0 type. This locomotive has been used to switch inbound coal deliveries at St. Elizabeth's hospital in Washington, DC. The locomotive itself is coal fired. In the back lot, the museum stores a few truck trailers that had been used for B&O's TOFC ("trailers on flatcars") service. B&OZ was the reporting mark. This particular logo is notable because the train depicted shows the "rising sun" paint scheme used briefly in the 1960s. 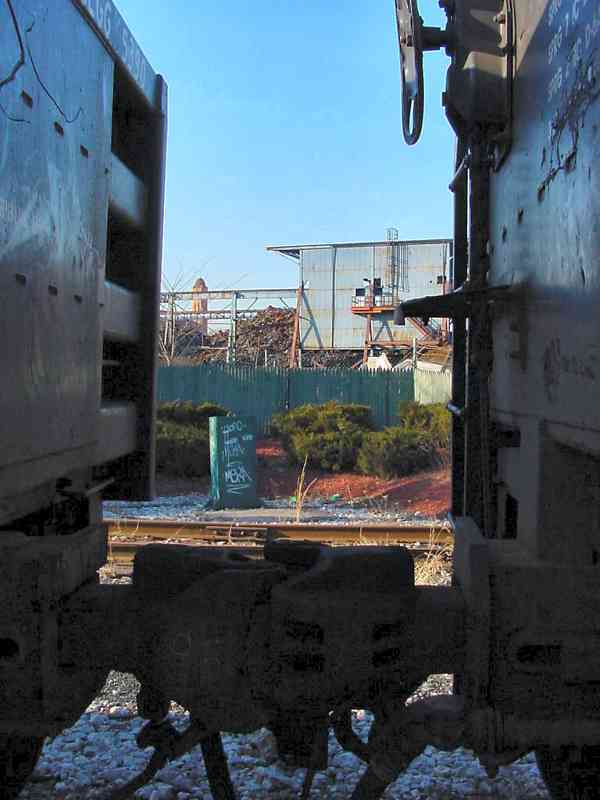 In the wake of the roundhouse's 2003 roof collapse, the back lot was reconfigured after this photo was snapped. 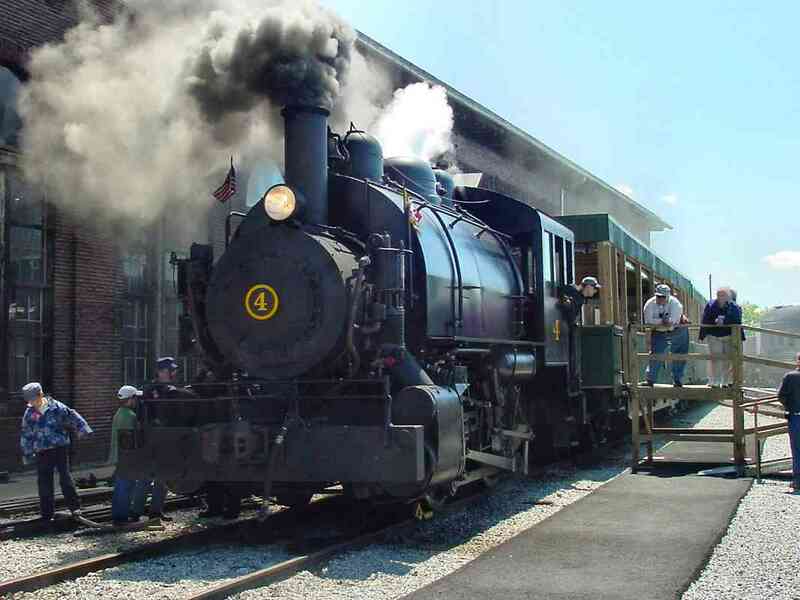 The B&O Museum operates a tourist train ride from the museum to almost the location of the ceremonial "B&O First Stone". This photo shows the view back toward the Mt. Clare station. 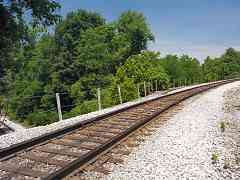 The B&O had many tracks leading into the station; all but the one seen here have given way to new development. I found the Mt. Clare Express tour somewhat disappointing. 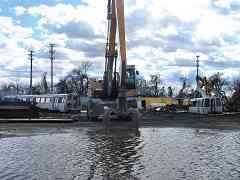 It doesn't quite reach the "first stone" location (because that's on part of the active CSX railroad). The tourguide's announcements were difficult to hear. And the scenery along the route left much to be desired. At least the passenger car we rode was air conditioned. At their maximum size, the B&O's Mt. Clare facilities reached almost a half mile west from from the Mt. Clare station to here at Carey Street. 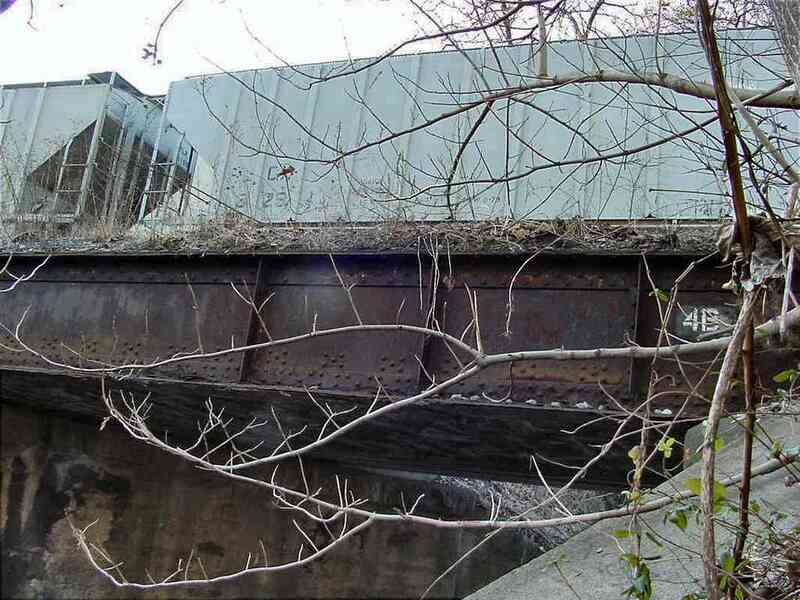 At one time, 5 or 6 tracks crossed via this bridge, but now the museum's single track is the sole survivor. Note the B&O logo on the bridge. Periodically, the museum hauls out some of its collection for Live Steam Weekend along the mile of track it owns west of the station. The event is a great opportunity to see some of this old equipment in operation. This is the museum's Lafayette engine, a reproduction of a 19th century design built for the B&O's 1927 Fair of the Iron Horse. The coaches being pulled illustrate how, at the beginnings of passenger service, horse-drawn carriages were adopted for use on the railroad. Scientific American's first issue bemoaned the state of the "awkward and uncouth cars of (18)35". Kudos to the museum staff for all the effort it takes to get these old beasts to breathe once more, and all the work keeping them in shape for us to enjoy. This is the William Mason, the world's oldest railroad locomotive still in operation. This 4-4-0 design dates to 1856 when it was built by the William Mason Locomotive Works in Taunton, Massachusetts. Here it is still wearing the accoutrements and polish applied for its 1998 appearance in the Wild, Wild West movie. 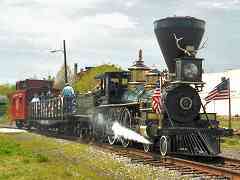 The John Bull locomotive, now part of the Smithsonian's collection, is often called the "oldest operable locomotive". In 1981, for its 150th anniversary, the engine was operated for one last time. 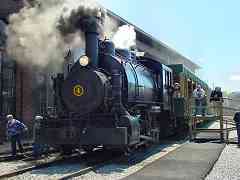 Here's the Porter 0-4-0 again, chugging out plenty of smoke while hauling visitors back to the museum. This is the first stone arched bridge west of Mt Clare and dates to before 1830, but was expanded in 1848. This could be a pretty location, except that the streambed is littered with clumps of trash. The nearby sewer lines contribute a distinctive odor as well. You won't find the other side of this bridge because it along with much of Gwynn's Run has been sequestered underground. 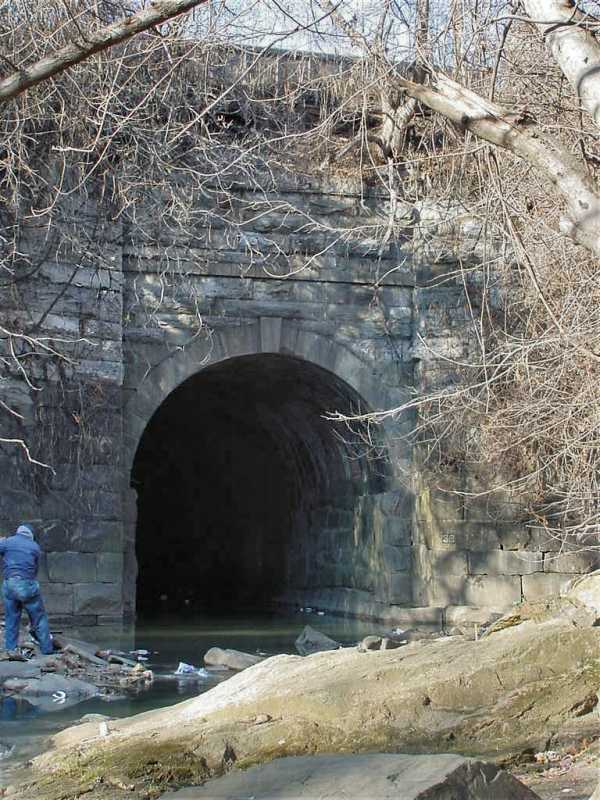 About 3 miles north of here the stream can be seen beginning its underground trek at a culvert on the north side of Gwynn's Falls Parkway west of Dukeland Street. Lake Ashburton and Wash Water Lake contribute to its flow, but old maps show Gwynn's Run originating just south of the CSX Hanover Subdivision's grade crossing with Cold Spring Lane. Perhaps the Cold Spring is the source. The person in the photo provides perspective on the substantial size of this bridge. He appeared to be a homeless man searching for scrap metal. This is not the best part of town. This is the location of the ceremonial first stone laid by the B&O. Charles Carroll, last living signer of the Declaration of Independence, turned the first spadeful of dirt to begin the construction of the railroad. The original stone has been moved inside the B&O museum and this marker took its place. The marker is shrouded to discourage vandalism. 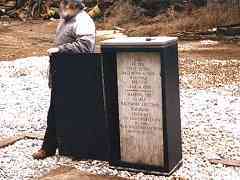 The inscription reads "Site of the First Stone, Baltimore & Ohio Railroad erected July 4, 1828. Marking the 1st mile Baltimore and Ohio Railroad. 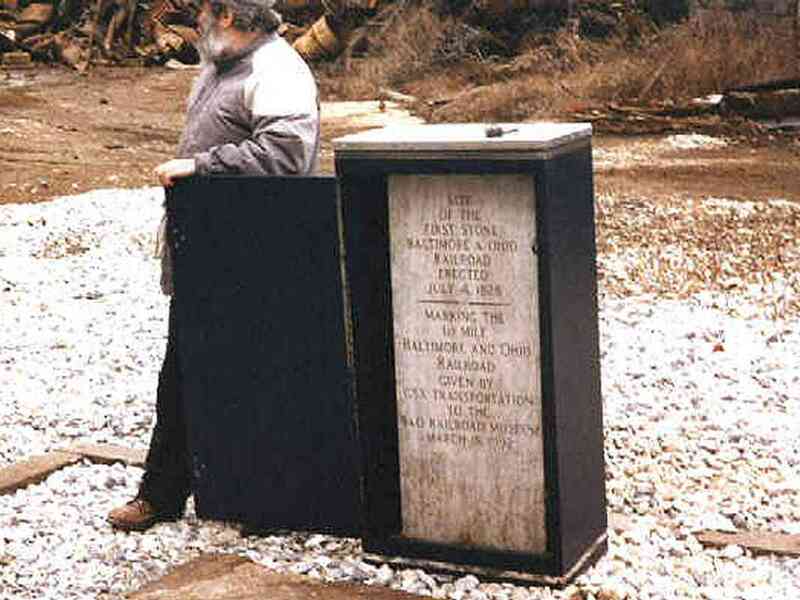 Given by CSX Transportation to the B&O Railroad Museum March 18, 1992." 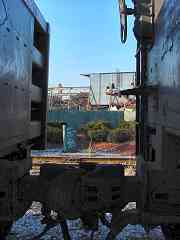 Tucked within a tiny grotto, with its back to an ugly scrap metal facility, framed by two cars, the shrouded marker can be seen across the tracks. This is also where the spur from the Museum meets up with active commerical railroad. Beginning during the 1960s the B&O was combined in stages with the C&O and other lines into what is currently CSX Transportaion. CSX-owned routes in the city vicinity are part of their Baltimore Terminal Subdivision. 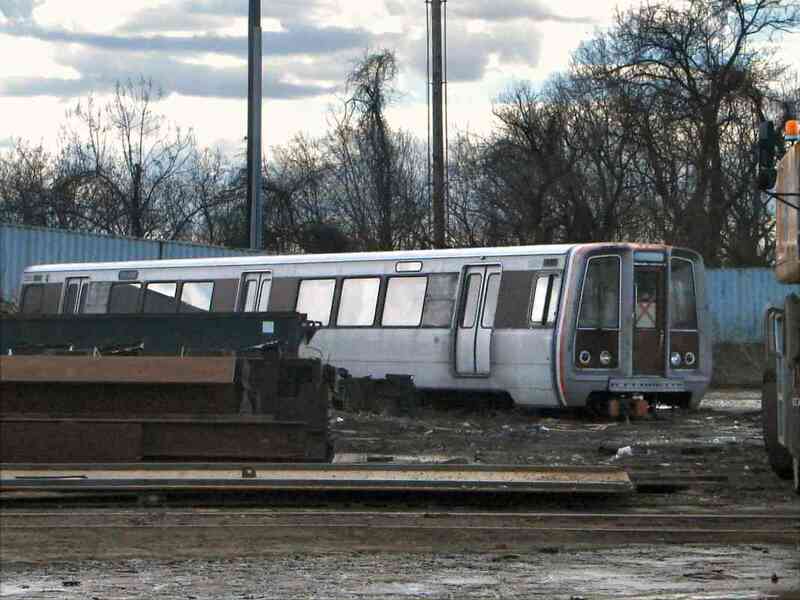 The Washington DC Metro System does not (yet) reach this far north, but its oldest units, the 1000 series - aka 1K cars - are seen here being dismantled at Baltimore's United Iron and Metal Scrapyard. 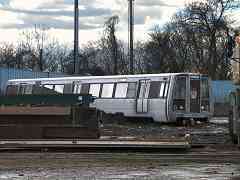 Taking on the duties of these 40-year-old originals are the Metro's 7000-series cars. Two passenger cars per week are retired and trucked up I-95 from the Metro's Greenbelt Station, a rate too slow to justify their transport by rail. Furthermore, towing them on CSX's equivalent route is complicated by incompatible braking and couplers, though they could be lifted onto flatcars. 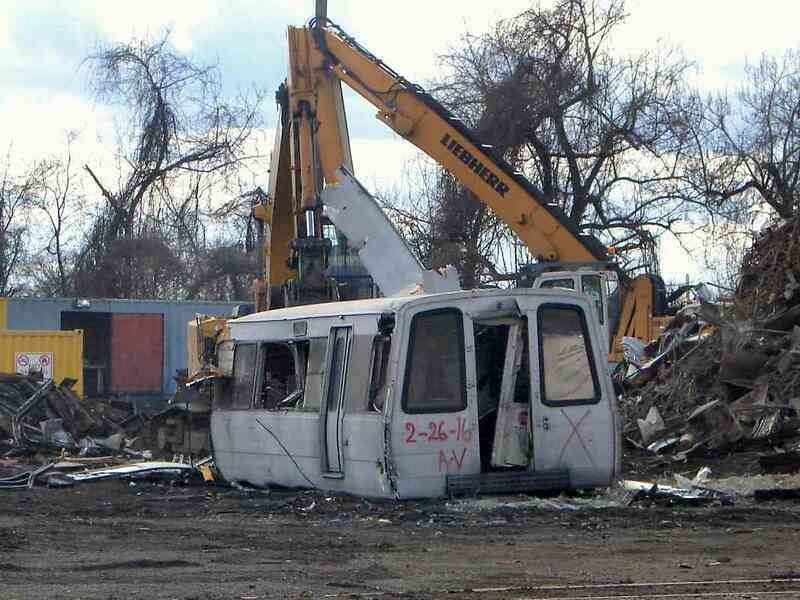 A rusty siding into the scrapyard would need cleanup too. 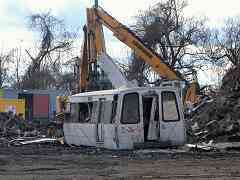 Before becoming a scrap yard this site had been a brick yard. 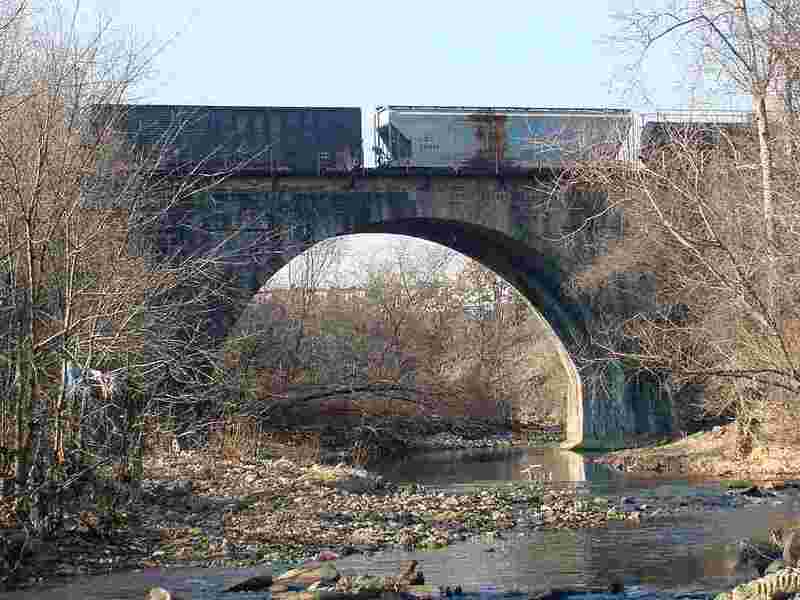 Built in 1829, the Carrollton Viaduct is the oldest surviving railroad bridge in the world, and remains in active use, a tribute to its original builders. No bridge has been in railroad use for a longer period. 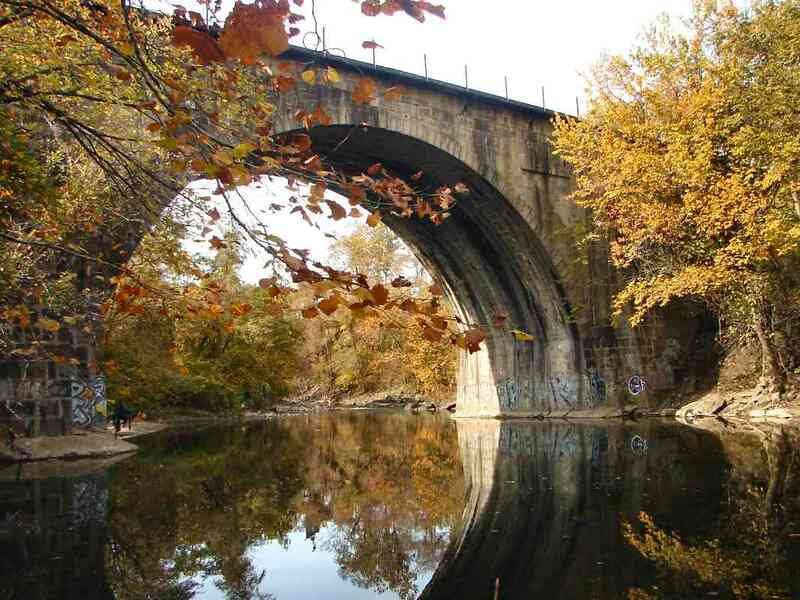 The viaduct is 297 feet in length and spans the Gwynns Falls (river). 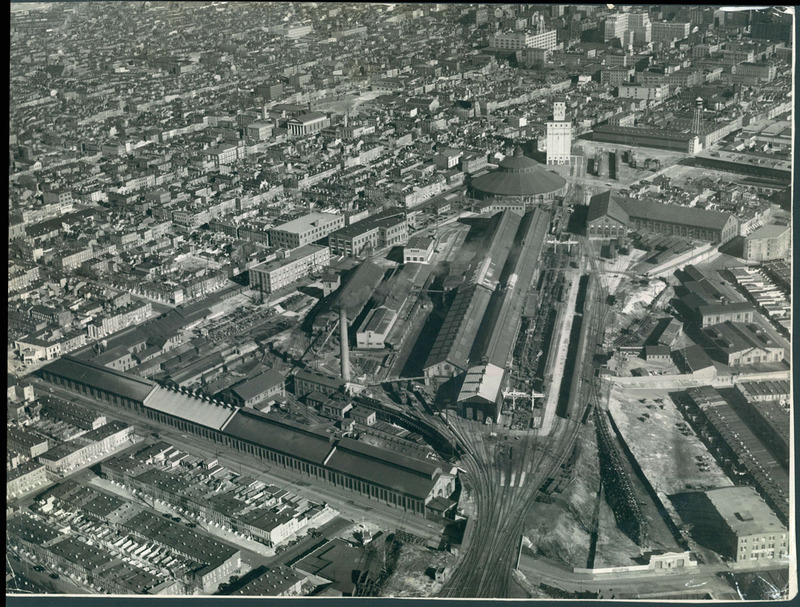 The B&O wanted to build south out of Baltimore, but politicians feared that doing so would encourage the development of a new, competing port along the Patapsco River, a few miles outside the city. So, they enacted a law specifying that the B&O's route must cross the city line at an elevation of 66 feet above sea level. This forced the railroad to build SW rather than S from Mt. Clare, and cross streams at a higher elevation, thereby necessitating expensive hand-built structures like this viaduct. 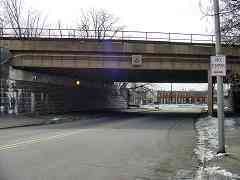 The viaduct is named in honor of Charles Carroll who owned the land in this vicinity. 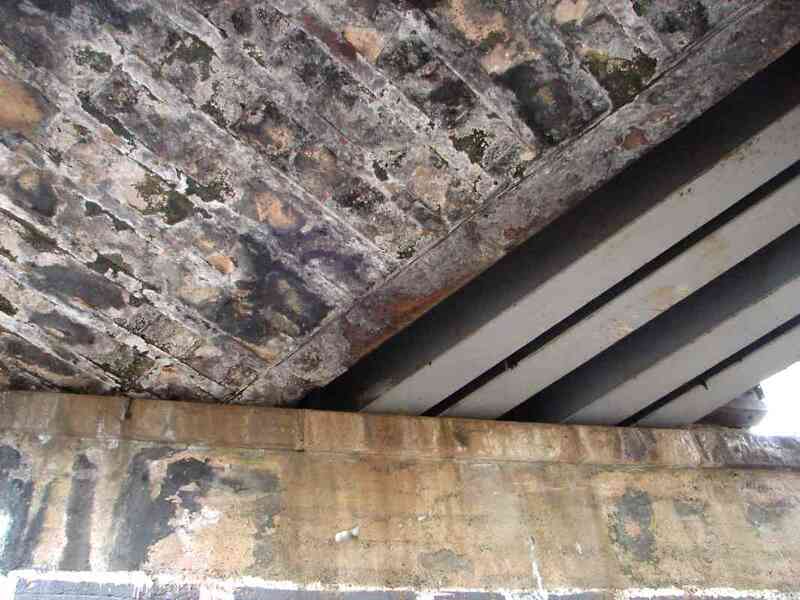 Unsealed in 2005 after being closed for decades is the former carriageway under the southwestern side of Carrollton Viaduct. 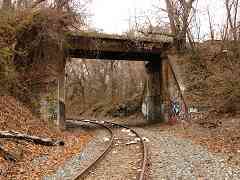 It's now part of the Gwynns Falls Trail. Interstate 95 passes about 1000 feet from the viaduct, but you'd never know it. 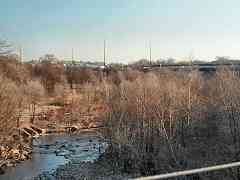 The viaduct is hidden in tree growth and surrounded by industry and a golf course. 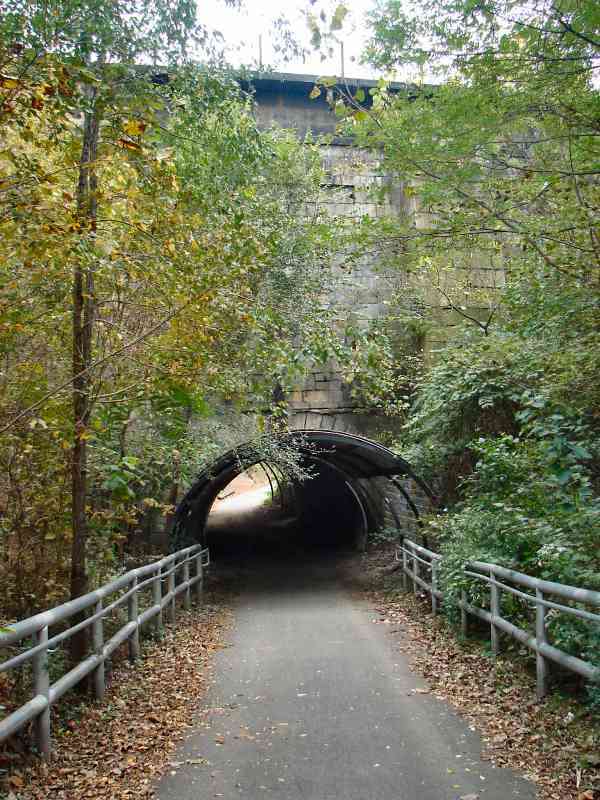 The best access is by hiking or biking the Gwynns Falls Trail, but note the trail passes through some less-than-great sections of town. 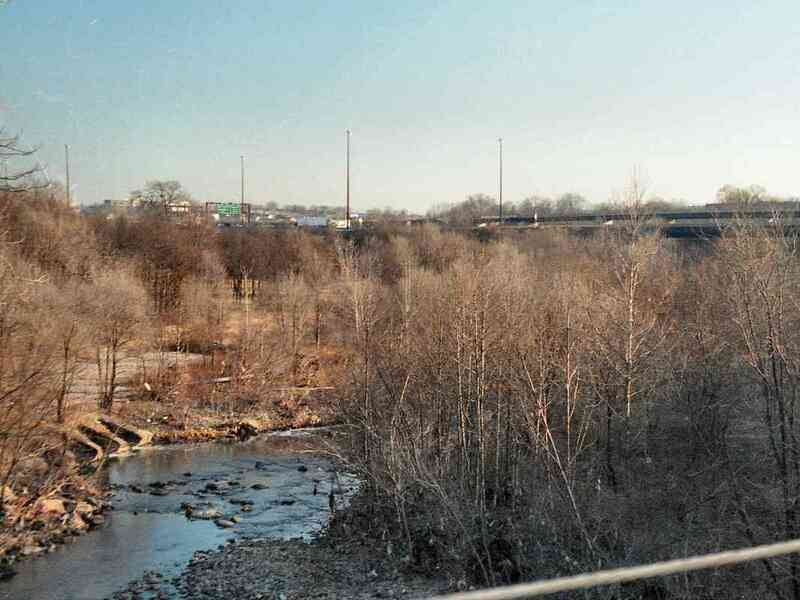 This photo looks from the SW side of the viaduct back toward the original location of the B&O's First Stone. Ex-Western Maryland tracks that pass nearby can just be glimpsed at the extreme left side of the image. The trees in this photo hide an ugly scrap metal facility that operates on the north side of the viaduct. There I discovered a HUGE (over 10-foot high!) heap of old bottle caps. Not the twist-off kind, the old pry-off kind with cork linings. If these are collectible, there's a real treasure trove hidden here. Here's the view looking downstream from the top of the viaduct. The golf course is on the left, and the Western MD tracks are hidden in the trees on the right. That's I-95 near exit 51 in the distance. You should be able to glimpse the viaduct from I-95 during non-leaf season if you know where to look. 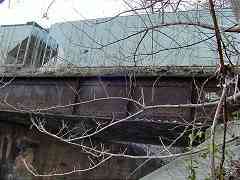 This bridge just west of the Carrollton Viaduct crosses over the former Western Maryland tracks. If this bridge is numbered 4B, and the Gwynn's Run bridge is 3B, what bridge number is the Carrollton Viaduct? Figuring out the B&O's bridge numbering scheme has been something of a pet project of mine. The bridges appear to be numbered consecutively as you head west, but there are several oddities, like "A" and "B" suffixes. 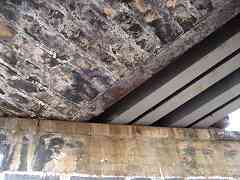 One half of the bridge is far newer than the other. 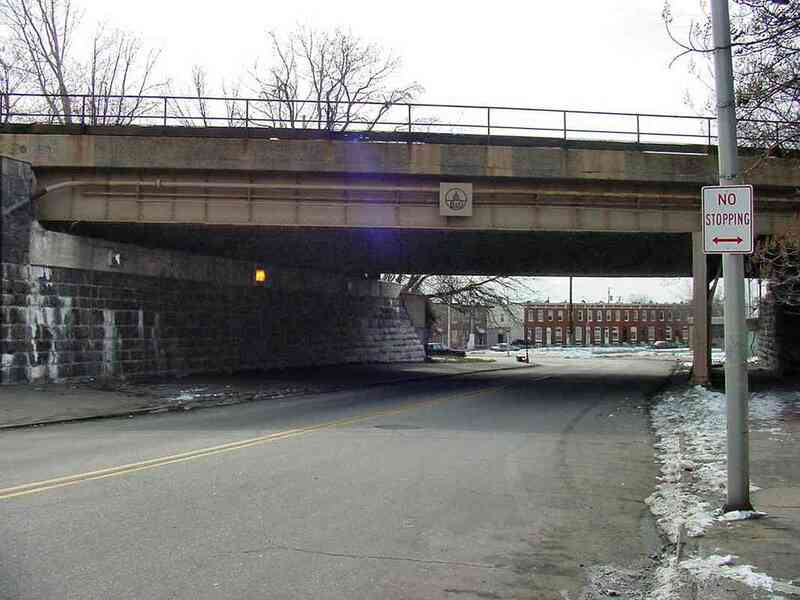 Since this bridge has always had room for double track, it is odd that both halves were not rehabbed simultaneously. 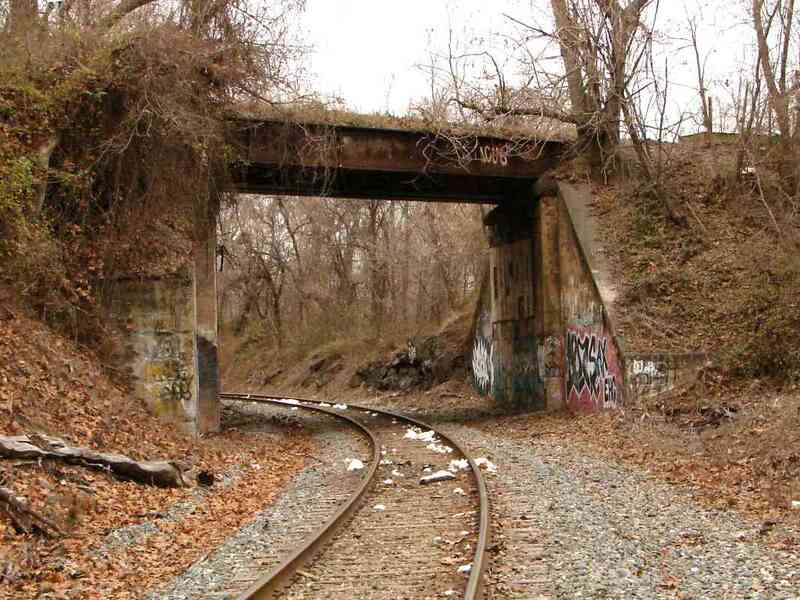 Bridge 4B became necessary only when the Western Maryland Railway (foreground tracks) in 1904 extended its line southeast from Fulton Junction to its then-new port on the Patapsco River named Port Covington.